A Lincolnshire hospital physicist has been recognised for his contribution to medical physics with a brand new award. Philip Cosgriff, Head of Nuclear Medicine for United Lincolnshire Hospitals NHS Trust, is the first recipient of the national Healthcare Gold Medal, awarded by the Institute of Physics and Engineering in Medicine (IPEM). This award is presented to members of the institute who have a substantial and sustained track record of contributing to the advancement of healthcare practice related to physics and engineering in medicine and biology. Medical physics, also known as nuclear medicine, is when diagnostic imaging is carried out using small amounts of radioactive materials called radiotracers. These are typically injected into the bloodstream, inhaled or swallowed and then detected by a special camera and a computer to create images of the inside of your body. Nuclear medicine imaging provides unique information that often cannot be obtained using other imaging procedures and offers the potential to identify disease in its earliest stages. It is often used to benefit patients with hyperthyroidism, thyroid cancer and other cancers. The pinnacle of Mr Cosgriff’s efforts in this area was being invited to write the Urinary Tract chapter for the third edition of Practical Nuclear Medicine, which was published in 2005 and which is still regarded as one of the best textbooks in the field. Throughout his career, Mr Cosgriff has been involved in the development of nuclear medicine nationally through involvement with the British Nuclear Medicine Society and IPEM. Mr Cosgriff said: “I consider myself very fortunate to have happened into medical physics in the first place and have met some wonderful people along the way. If I have helped in some small way to advance the practice of nuclear medicine, as implied by this recognition from my peers, then I am truly happy. The Healthcare Gold Medal award is presented to an IPEM member who has a substantial and sustained track record at an outstanding level of contribution to the advancement of healthcare practice related to physics and engineering applied to medicine and biology. IPEM is a professional association and Learned Society with 4,300 members working in hospitals, academia and industry across the UK, who are physicists, engineers and technologists working with applications of physics and engineering applied to medicine and biology. As a charity, IPEM’s aim is to advance the application of physics and engineering to medicine for the public benefit and to advance public education in this field. Mr Cosgriff, who is a Fellow of IPEM, began his career in medical physics as a basic grade trainee in the Medical Physics Department at Leicester Royal Infirmary. He did a two-year day release MSc in Medical Physics at Leeds University as part of his basic training, before being promoted to senior grade physicist in nuclear medicine in 1981. 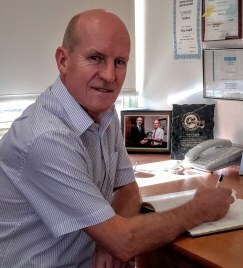 He became Head of Medical Physics at Pilgrim Hospital in Boston in 1986 and organised one of the first nuclear medicine standardisation meetings at the IPEM offices in York in 1991, which resulted in one of the first consensus papers on this subject (Towards standardisation in gamma camera renography). He was on IPEM’s Nuclear Medicine Special Interest Group, which played a huge part in validating the results from the various software packages used to analyse clinical data.